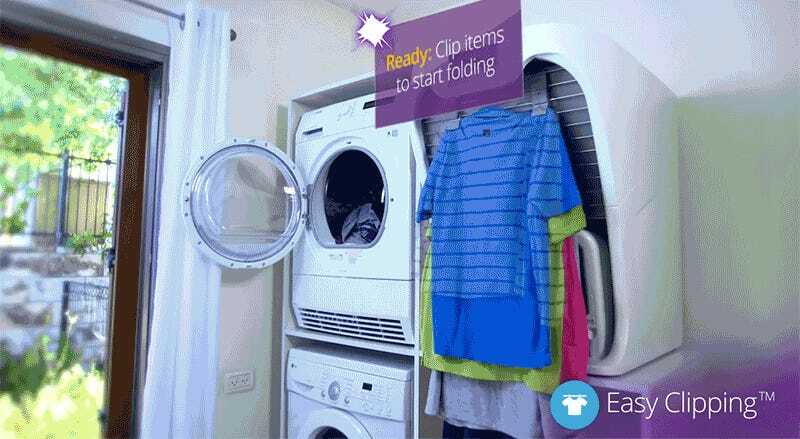 The makers of the FoldiMate realize that the worst part of doing laundry is having to fold all your clothes once they come out of the washer and dryer. A third machine that does all that for you could revolutionize chores as we know it, but the FoldiMate might not be the answer to our lazy prayers. Designed to sit next to your other laundry room appliances, the FoldiMate is able to neatly fold, steam, de-wrinkle, and even soften your clothes using your fabric softener of choice. Folding takes as little as 10 seconds per garment, and when it’s done you’re left with a neat stack of clothes ready to be hastily crammed into a dresser drawer. It almost sounds like the perfect “shut up and take my money!” invention, until you start digging into the details. In an ideal world your clothing would automatically go straight from the dryer into the FoldiMate, but unfortunately that step’s left to you. You need to clip each piece of clothing onto the machine’s integrated rack, which can only hold about 15 to 20 pieces—so you can expect to have to refill it multiple times. The FoldiMate can’t handle everything in your laundry either. Massive unwieldy bath towels? You’ll still be folding those by hand. Smaller undergarments and socks? That’s all you as well. It sounds like a good reason to just give up underwear altogether and go commando, but there are still lots of garments in your laundry that will need to be folded by hand. Pricing is expected to be upwards of $850, which is expensive, but totally worth every penny if it was able to fold every last thing coming out of your dryer. But that’s simply not the case. The extra steps needed to first sort your clean laundry, and then repeatedly load and unload the machine, make the FoldiMate less appealing. And having to wait until 2018 to get one means you might as well just keep dumping your clean laundry on the floor, and just dig around for whatever shirt you need.